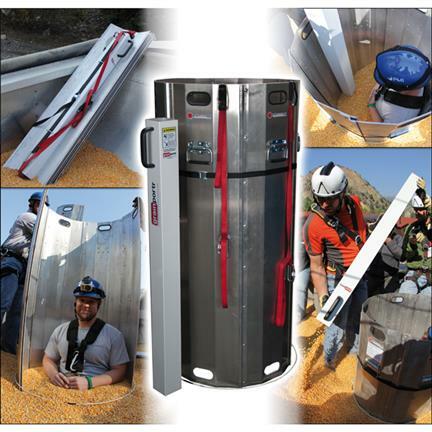 PMI’s new Grain Evacuation Tool – the GET Coffer Dam Solution, is a complete rescue solution designed and manufactured by Montezuma Rescue Innovations. The GET is made up of six interlocking aluminum panels used to form a circle and isolate an entrapped person from the grain surrounding them. Included in the solution is the Grain Portr – a revolutionary tool used to quickly remove the grain inside the GET, thereby freeing the subject from the grain. Also included are probe poles that make a target ring surrounding the subject to accurately position the GET panels. Interlocking panels fit through the smaller openings found in the top of older style grain bins • The GET contains two foot straps to help drive the panels into the grain • The Grain Portr grain removal device can quickly remove grain inside the GET Coffer Dam • Probes convert into a target ring to position the GET around the subject • The GET solution fits into a compact package for storage, or lowering into a grain elevator or bin • Made in the USA. Lost your Customer ID or need account assistance? Join our Mailing List to get the latest trainings, webinars and product updates!